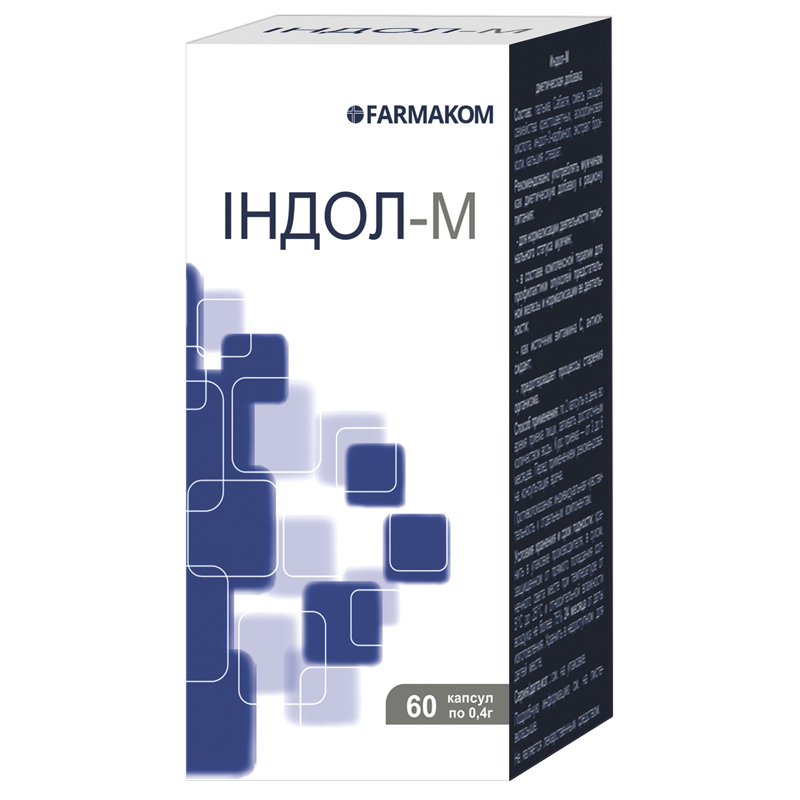 Indole-M is recommended: In complex therapy for prevention of prostate tumors; For normalization of prostate functioning; For normalization of male hormonal profile; As an additional source of Vitamin C, antioxidant; For prevention of body ageing processes. Saw palmetto – 160 mg, mixture of vegetables of the mustard family (carrot, all the types of cabbages) – 91 mg, ascorbic acid – 90 mg, indole-3-carbinol – 45 mg, broccoli extract – 10 mg. Mixture of vegetables of the mustard family is a source of biologically active substances in human diet with a powerful antiproliferative effect. The unique action of the vegetables of the mustard family is explained by the presence of active natural indolic compounds: food indole, ascorbinogen, diindolylmethane, as well as isothiocyanates, the most active of which is sulforaphane. Broccoli extract is a natural source of biologically active substances with antiproliferative effect. It contains great amount of selenium (a microelement with a powerful antioxidative effect, improving cardiovascular system, liver and gastrointestinal tract functioning, boosting immunity, stimulating insulin secretion), vitamins C, A, B-complex vitamins, antiulcer vitamin U, microelements: potassium, calcium, phosphor, iron, sodium. Broccoli intake shows good results for prevention of such illnesses as atherosclerosis, gastrointestinal diseases, and benign prostatic hyperplasia and in complex treatment thereof. Saw palmetto is extensively used to boost sexual activity in men, increase sperm production. It has anti-inflammatory and antiseptic effects, it is used as a diuretic; Saw palmetto is especially effective to relieve symptoms of benign prostatic hyperplasia: it decreases amount of prostaglandins, promoting inflammatory process, in urea significantly, reduces prostate tissue edema and residual urine volume. It reduces cholesterol absorption and improves its evacuation from the body. Ascorbic acid (vitamin C) is an active participant of oxidation-reduction processes regulation in the body; it regulates carbohydrate metabolism, blood clotting process, tissues regeneration, reduces vascular wall permeability; it has antiplatelet and expressed antioxidative properties. It improves body resistance to infections, inhibition of formation of mediators of inflammation and allergic reactions – provides antihistamine effect. It reduces toxicity and boosts efficiency of a number of methods of chemotherapy and radiation therapy. 2 capsules once a day with food; wash down with sufficient amount of water. Term of use is 3-6 months. Proteins – 1.6 g, carbohydrates – 0.68 g, fats – 0.2 g.